Built to last, these diamond-patterned aluminum Tool Boxes can handle up to 250 lbs. of storage. Stationary Tool Box features a removable sliding tray with rubber mat, dual gas shocks for smooth opening and closing, and a one-touch latching mechanism. 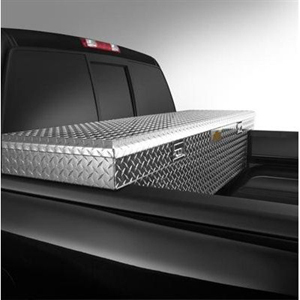 It mounts securely to the bed of your Silverado without drilling. Sliding Toolbox slides along the Cargo Management System (CMS) rails (available separately) in the pickup bed for easy organization and access. Both feature the Bowtie logo. Side Storage Box can be secured at any position along the CMS rails. The integrated handle makes it easy to remove and carry.